In a time of tense political debate and legislative gridlock between the two major parties, the new director of the Graduate School of Political Management hopes to put humanity back into politics. Lara Brown, who was named GSPM’s director in July after serving in an interim role, said in an interview last week that she planned to use the rapidly growing school to tamp down the cynicism associated with politics while boosting the school’s public profile and showcasing the achievements of its alumni. “What we hope to eventually do is really train this next generation of political leaders, train our alumni, and through the process, help to kind of humanize who are the people in politics,” Brown said. As GSPM celebrates its 30th anniversary this year, Brown said engaging the school’s roughly 4,000 alumni in several events over the coming academic year will advance the school’s mission of creating a more civil political climate by highlighting alumni who are engaged in politics to serve the public. “I feel like part of our role once we reconnect our alums is to essentially help the country create a more productive positive discourse around politics,” she said. Brown served as GSPM’s interim director for a year after former Director Mark Kennedy left to become the president of the University of North Dakota. She said about 1,500 of the school’s alumni live in D.C., giving the school opportunities to promote face-to-face interaction. 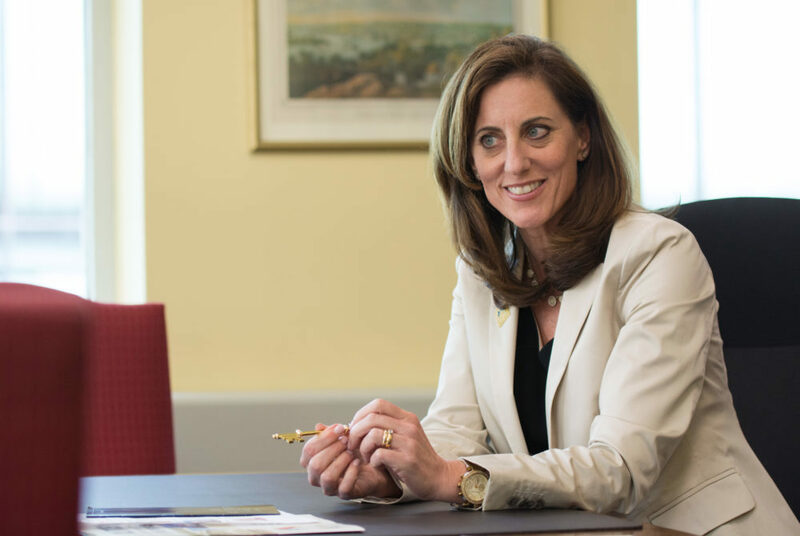 Last year, Brown said she worked to create a printed alumni directory using LinkedIn accounts that now lists about two-thirds of the school’s alumni. “She’s really brought alumni back into the school, making sure that alumni are aware of the events coming up and asking for our input on different types of events,” he said. Matthew Dallek, an associate professor of political management within GSPM, said the school’s alumni network was frayed before Brown began the push to increase communication both within GW and to former students. “I have seen and been impressed by the degree to which she has built up the connections with the network of alumni throughout the city, because it had sort of atrophied,” he said. Brown said the school hopes to start spreading GSPM’s message by hosting a new conference next spring. “Framing the Future,” set to be held in March, will focus on putting a spirit of “sportsmanship” and cooperation back into politics by bringing people together and focusing on communication, she said. “Our alumni are the ones really crafting the communications for politics and advocacy groups all around D.C. and really the country,” Brown said. She said the goal is not to be nonpartisan, but to encourage students to use their ideological beliefs to improve society through their work in politics. Along with alumni engagement, Brown said she hopes to bring more women into politics and increase diversity within the school. The school plans to partner with five organizations dedicated to helping women run for office, though the exact details have yet to be finalized, she said. “We spend a lot of time casting a wide net, partly because I, personally, am someone who believes that leadership comes in all packages,” Brown, who is the first female leader of the school, said. Brown said the school has also recently created relationships with the Congressional Black Caucus and plans to send representatives to historically black colleges and universities to recruit undergraduates. The school’s strategic plan, which was penned by the former director in 2012, made international politics and globalization a major focus and is set to be completed this year. Brown said she will continue this focus as director by creating a new concentration in global politics this fall. “Our students who really want to do political advocacy campaigning around the world will be able to take those classes and be assured that they are getting a global perspective on politics,” she said. GSPM initially planned to roll out programs on state politics in four states by the end of this year, but Brown said the school now hopes to create state residency programs, allowing students to study legislation in specific states. Those programs haven’t yet been developed and a launch date has not been announced, she said. GSPM’s enrollment has grown each year since 2012, reaching 435 students in its on-campus programs as of fall 2016. Jonathan McGee, the senior marketing director for GSPM, said the school’s enrollment nearly doubled from last year, though exact enrollment numbers haven’t been released. McGee said that as the school approaches its 30th anniversary, it wants to brand itself as the school that “puts you in the room where it happens,” – referring to important political decisions – and that Brown will allow the school to achieve that goal. “That’s the main piece of our strategy and efforts over the past year and three months, and Lara’s goal really, truly is to make good just on that,” McGee said.